Happy Monday everyone! We're taking a break from our Pearl Street Project reveal to share a truly awesome interview we did with Cynthia Harper. This is a bit different from previous interviews we've shared because Cynthia isn't an interior designer. She's a stylist...amongst other things. A stylist (versus an interior designer or interior decorator) is someone who specializes in curating the decor of a space - the pillows, art, coffee table books, sculptures, plants...you get the idea. The person who handles all the details that make a space not just gorgeous but also livable. And Cynthia Harper is an incredible stylist. You can follow her on for a daily dose of beauty, which we highly recommend you do. Or, check out her brand new website. Not only will you find gorgeous, inspirational home design ideas and images, but also heartwarming tidbits of her personal life and some universal words of encouragement. She's a true talent and GEM. Gray Oak Studio - What is your "job title"? Silly question, but hear us out: you do SO MANY things! You're a stylist, you have an Etsy shop (Harper and Arrow Marketplace), you're an Instagram Influencer (71k followers as we write these questions), you mentor Instagram newbies interested in growing their following...what are we missing? You're a busy lady. Cynthia Harper - That's a great question, and one I've wondered myself, lol. Though to be honest, I've never been one who feels the need for titles or labels. I love being creative and helping others, and as opportunities have arisen to follow my dreams and implement new ideas, I have embraced them. That being said, I consider myself a product stylist and educator, with my primary goal being to encourage and equip others to live their lives with authenticity and joy. Gray Oak Studio - Of all that you do, what is your favorite? Cynthia Harper - My favorite job of all is actually one that wasn't mentioned above, and that is being a mom! That is a lifelong dream that I've been fortunate to see fulfilled. I've often told people that the only 2 "followers" I have that will ever matter are my 2 children. Outside of that, the rest of this is empty. Gray Oak Studio - We can't tell you how many times we've been searching Pinterest for some personal or professional inspiration and landed on "the perfect image"...of your home. You style is so clean and bright, yet comfortable and approachable. How did you land on a style that felt right for you? Cynthia Harper - It took several years for me to really determine what my true style was. And it started to happen when I began to listen to my own inner voice that told me if I truly liked something or not. I don't think about if it's trending or if my best friend will like it. The question is "Do I like it?" When I stopped designing my home for what I thought it 'should' be and instead started designing it for what sparked joy in me, that's when I really began to hit stride stylistically. For example, people in my real life told me that subway tile to the ceiling in a kitchen was crazy and that I was planning far too much white in my kitchen. Imagine if I had listened to them, instead of my own desires. I would be missing out on a kitchen that I love, and which is coincidentally also appreciated by many people on social media too. Gray Oak Studio - And when you're shopping for that perfect piece and you find something, how do you know it will work not only functional wise but within the context of your style? Cynthia Harper - I gravitate toward neutrals with lots of texture because it's so important to use texture to keep a space from falling flat. And when I'm shopping, I always ask myself 2 questions before I buy something: "1) Are there are least 3 places in my home that I could put this? and 2) Would I still consider buying this if I had to pay twice as much for it?" If I can answer yes to both those questions, then I know it will work within the context of my style because I know it will be a versatile piece that will work in many rooms, and I know that I'm not just tempted to buy it because it's a cheap impulse purchase. Gray Oak Studio - Who inspires you? What Instagram feeds are you most excited to see pop up on your feed? Cynthia Harper - There are so many! That's a tough one to narrow down. I'm inspired by big design firms like @studiomcgee, and by other interior stylists & mamas like @brepurposed, @arrowsandbow and @thehouseonbeachroad, to name a few! I'm also inspired by the insightful humor and wisdom of my friend @thefestivefarmhouse. There's just so many who inspire me on instagram! Gray Oak Studio - Your home featured white walls long before they became the rage. What draws you to white walls? And, if you don't mind sharing, what are your favorite white paint colors? Cynthia Harper - I love the clean calm simplicity of white walls, and I love that they are the perfect blank canvas for creating any space I can imagine! I love White Dove by Benjamin Moore and Snowbank by Olympic (the perfect crisp white). Gray Oak Studio - What is your dream project? Cynthia Harper - I have 2 dream projects! One would be to one day renovate an RV and spend the summer traveling in it with my family. The idea of creating a vehicle for us to go explore new places as a family is exciting! And then while we aren't traveling in it, we could rent it out as an airbnb or something. That would be fun! Also, I'd love to one day have a studio space that can be utilized by creatives and small shop owners for photo shoots, or hosting markets, or events. A place to build community and creativity while empowering and equipping entrepreneurs and creatives...that would be a dream come true! We are so grateful to Cynthia. Her thoughtful, wise words were a joy for us to read and we hope you feel the same. Have a wonderful week! Today we're sharing the interior design wisdom of Bria Hammel, of Bria Hammel Interiors. We reached out to Bria back in January and asked if she would be willing answer a couple questions from the likes us, major fans. She was immediately responsive and incredibly generous. We are such major fans because Bria Hammel Interiors creates undeniably gorgeous designs. Just scroll through the portfolio and you will see bright, fresh spaces done right in so many different ways. She does use color, and we mean hot pink and bright yellow, but it's mostly white, neutral palettes that feel inherently clean and inviting. While traditional stylings are certainly her wheelhouse, she kills modern too. 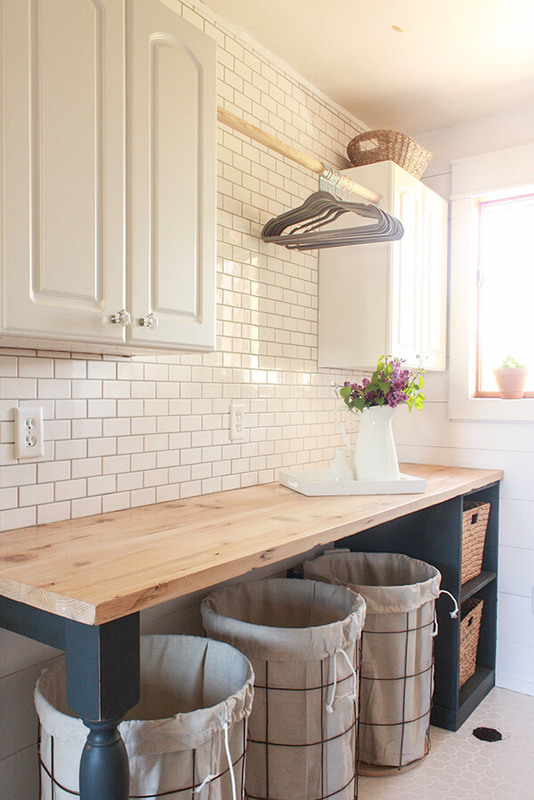 I mean, check out this mudroom from The Orono House project. The wide plank walls, the light gray and white checkered floor. Just perfect. Gray Oak Studio: Your aesthetic is so clean and bright. We absolutely love it. And, yet, you’re not afraid to use color! What tips or strategies do you have for people who want to use color or try out a new trend but are a little afraid or unsure? Bria Hammel: We always tell our clients that are afraid of too much color to use it in places that aren’t as big of commitments. In the kitchen- if you are afraid to paint all your cabinets a fun color, take the risk on the backsplash. In the great room- afraid to commit to buying a bright colored sofa? Have fun with the chairs and pillows, or use color on your window treatments. I think it’s important for clients to push their style. We all sit and look at thousands of pictures on Instagram and Pinterest and the ones that always stand out are the spaces where people took risks! I’ve never had a client regret it. Gray Oak Studio: Other than the kitchen, what do you think is the most important room for people to focus on in their home? What is an aspect in design that you think people should not skimp on? And then, when is going budget a no brainer? the home to a new level! Typically we can be budget friendly in bathrooms and bedrooms. There are so many beautiful simple tiles, and sometimes just adjusting the pattern can still make a statement. It kinda hurts it's so pretty. Sigh. Alright, that's all from Bria for today. Although, you can check out our post from last month about 2018 design trend predictions, which includes one of Bria's predictions (click here). And you can also get excited for more great interview fun with more great designers - next month we're sharing the wise words of Marie Flanigan!